I was asked the other day by the people at Blu to give their new Twitter client out and see how I like it. 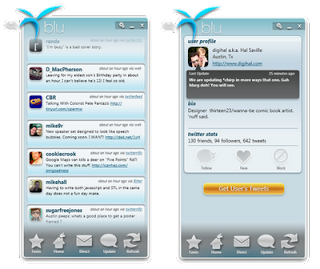 Blu, by the company Thirteen23, has release this very flashy and graphical Twitter client native for Windows Vista and Windows 7. Developed using C# (Microsoft .Net), this new client has alot of impressive animations and while also running very smoothly when moving around the application. Unlike other Twitter clients, being native to Windows means that installing of frameworks like Java or Adobe AIR is unnecessary. The interface is straight-forward and empolys a single-column layout allowing for simple list viewing of recent tweets. Clicking on tweets allows for replying and retweeting as well as for users to view entire conversations. The software remains basic with the absence of choice of URL-Shorting service(TinyURL is used by default) and photo hosting services that users of TweetDeck and Seesmic Desktop have come to expect. Overall I am impressed by the interface and design, however I have had experiences of the transistions not running as smoothly as I hoped.